Radisson Blu Hotel, Sohar is the only beach front address in the Northern Province of Oman. At 12 kms from the industrial port and 5 kms from the business district, the Radisson Blu Hotel, Sohar offers 179 rooms and suites in the heart of the Batinah capital. 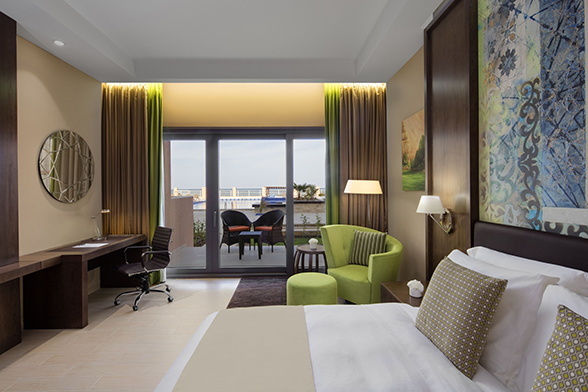 Radisson Blu announced the opening of Radisson Blu Hotel, Sohar. This is Rezidor’s fifth hotel in operation in Oman. For business travelers and event planners, the hotel features meeting facilities for up to 80 delegates as well as a sizeable ballroom that comfortably accommodates 700 guests. This hall can be readily converted into an exhibition hall with a dedicated wide entrance providing direct access from the hotel car park. "Radisson Blu Hotel, Soharis the perfect addition to our portfolio of great destinations for international guests, especially business travelers. With a stunning location surrounded by pristine beaches, gorgeous views over the city and sea, proximity to the port, extraordinary bars and restaurants, wellness center, and so much more – we have something to delight every guest in Sohar. We are looking forward to welcoming our loyal corporate clients, Meetings & Events customers, and Radisson Blu global fans to this exciting city on the Gulf of Oman," said Francois Galoisy general manager Radisson Blu Hotel Sohar. The hotel's three restaurants and bars provide a choice of food and beverage choices and include the Al Zafaran Restaurant, an all-day dining which creatively combine international fare with local flavor as well as the hotel’s signature restaurant, Amaranthai serves refined Thai and Chinese cuisine in a relaxed and authentic setting. For a casual drink, guests can unwind at Al Khaimah roof top bar with a shisha terrace to enjoy the sweet sounds of classic Arabic music around the trendy Aqua Bar.